Man Camp is over…now what? In this 4-week study, we will look at how men can build on the excitement about God and what He has done, to commitment to Him and His path for their life. We have all had those mountaintop experiences, now how do we live life fully devoted to Him when we come down from that mountaintop. As we deal with the issues that are unique to men, we will find full freedom to follow God and how He has designed us to live. This class is a 4 week class on Tuesdays from 6-8pm. 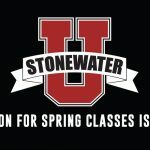 Class begins on February 7th and there is no cost.